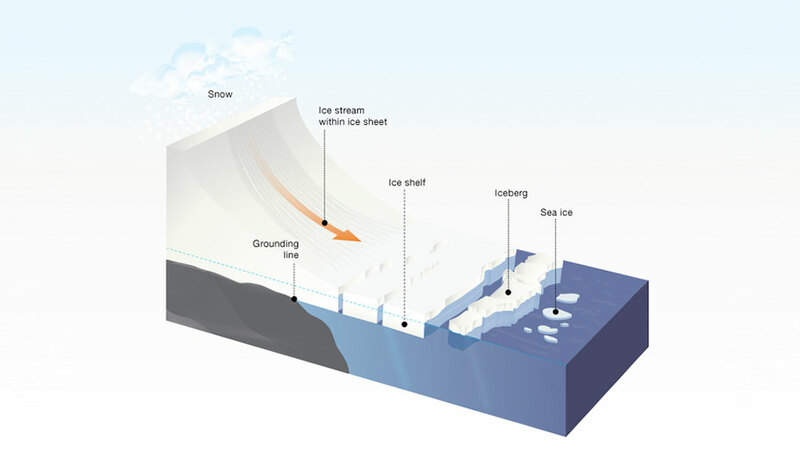 Image illustrating how ice flows off the continent and out to an ice shelf, which floats on the surface of the ocean. Professor Frank Pattyn is a glaciologist and ice sheet modeller at the Université Libre de Bruxelles (ULB). In November 2008, he will lead the first team of five scientists to the new Belgian polar research station "Princess Elisabeth Antarctica". By that time, the eight wind turbines will have been mounted on the Utsteinen ridge and the station's exterior shell will be completed. The scientists, however, will have to wait until March 2009 to see the interior facilities (power supply, recycling facilities and systems controls) fully installed. In the meantime, the Princess Elisabeth Station will only be used as a hub to house communications, safety lines and scientific equipment. The scientist's research will concentrate on glacial grounding lines and will be carried out in collaboration with the ULB, the University of Washington (USA), and the University of Aberystwyth (UK) within the context of a much larger project focussing on Antarctic subglacial processes. It is part of the IPY project SALE (Subglacial Antarctic Lake Environment) as well as of an ongoing project of the Belgian Scientific Policy Office. Frank Pattyn has already participated in two expeditions (2004 and 2005) to Utsteinen to help position Princess Elisabeth Station, and to collect and analyse the necessary meteorological data around the site. Why is Utsteinen a good place to build a polar station? Most bases are located in rocky coastal areas, and the rare inland stations are usually built directly on the snow surface, where they face high snow drift rates and unstable weather. Working conditions on inland stations are thus very difficult, and the buildings usually have a short lifetime as they get buried quickly under the snowpack. The idea here was to find an inland building site that was both protected from the wind and easily accessible. We wanted to build the station on bare rocks so as to prolong its lifetime. Aside from the fact that Utsteinen is located in an area that lacks research and study from a scientific perspective, the western side of the mountain range also proved to be a good site for practical reasons. Strong katabatic winds blow in from the East, meaning that the western side of the ridge is shielded from the bad weather and from snow accumulation. An automated meteorological station was set up at Utsteinen for over a year in order to collect data on the site. After comparisons with data gathered from the Japanese station (60 km away from PEA) and other nearby stations, we found that Utsteinen offers a particular microclimate. Not only is it significantly warmer at Utsteinen,but the wind is also milder, thanks to the mountains acting as a shield and to the fact that the site is 200 km inland from the coast. Low-pressure weather systems do not penetrate that far within the Antarctic continent mainly because of the high elevation. What makes Utsteinen such an interesting site for scientific research? The nearby Sør Rondane mountain range is one of the many fringing mountain ranges that surround the Antarctic continent. The mountain range peaks through the ice sheet, and the valleys can be regarded as an ice covered fjord landscape with the glaciers' bed lying well below sea-level. The glaciers can be used as routes to get to the polar plateau or anywhere else and have an ice thickness of more than 1000m. They make the ice sheet terrain easily accessible in order to carry out various geological, glaciological, biological and hydrological studies, as well as to study astronomy, solid earth science and geomorphology. Another advantage is that Utsteinen is easily accessible, whether by land or by aircraft. The ice road from the coast to the mountain range follows an ice rise and is one of the rare inland access routes to be safe. What research will your 2008 expedition be focusing on? Glaciological research at the ULB essentially focuses on polar ice sheets, such as Antarctica. The 2008 expedition will concentrate on quantifying the mass loss/gain of the ice sheet in view of recent climate change. There is currently a great lack of accuracy in the models that are used to predict the effect of climate change on the mass loss or gain of ice sheets. The major reason for this is that there is a lack of knowledge on the dynamic behaviour of grounding lines. The grounding line is the area where the ice sheet, as it flows towards the ocean, starts to float and forms an ice shelf. While the carving off of icebergs further downstream constitutes the main cause for the mass loss of the Antarctic ice sheet, changes in the mass flux across the grounding line also has a direct impact on sea level. This is because as ice crosses the grounding line, it becomes part of the ocean system and positively contributes to sea level rise. It is therefore important to know the amount of mass loss that can be attributed to melting, but also the amount of mass loss that provokes an increased mass discharge across the grounding line. What we need to know, is whether these grounding lines are stable and how easily they migrate. How will your study be carried out? We wish to go to an "ice rise" situated 150 km away from"Princess Elisabeth" Station, on the route to the station as you drive inland from the coast. This ice rise is a kind of "pinning point" (an island of grounded ice sheet surrounded by floating ice shelves) that helps to stabilize the coastal ice sheet. From there, we can carry out ice radar measurements, velocity measurements with high-resolution permanent GPS stations, shallow firn coring and deep ice-coring along the grounding line). We are interested in studying the ice sheet's behaviour here over the last 10,000 years. The purpose is not to extract a climate signal from the ice cores (ice cores are not solely used for climate) but to establish the deformation properties of the ice. The last glaciation terminated 10,000 years ago, as Earth entered the Holocene, a period of climate optimum. During this period of glaciation, the ice sheet expanded laterally over the continental shelf and reached areas that are now covered by ocean water. At the end of this glaciation period, a major retreat of the ice sheet began, lasting until the beginning of the Holocene. The point of our research is to find out whether the ice sheet remained stable after this retreat or not. As such, we will be able to identify whether grounding lines migrate easily or not, a factor which has become important in view of recent global warming: further retreat of the grounding line drains more grounded ice into the ocean, making sea level rise. In some areas of the Antarctic ice sheet (Pine Island Glacier for instance), substantial grounding line retreat and ice sheet thinning have been observed over the last decade and have lead to a significant amount of ice loss. With ice radar measurements, it is possible to map the internal layers and structure of the ice rise and, from there, see for how long the grounding line has been stable (by counting the layers). Firn cores are used to determine the mean annual accumulation (a firn core is a core at the surface of the snow down a few metres, where you don't find ice yet but a densified snow called firn). We also want to measure the ice flow and direction. Using the radar layers, it is possible to see whether there was at a certain time a change in ice flow, a change in direction, etc. It is then possible to see how stable the grounding line was and when the grounding line was actually part of the big ice sheet had there remained a singular ice rise, etc. Another point in the stability of grounding lines, and of ice rises in particular, is that when you go down to the coast itself to reach the grounding line, you find formation of marine ice: the ice sheet more or less breaks up to form bottom crevasses and, inside these open crevasses, ice of oceanic origin appears (ocean water that freezes in). Marine ice, however, can stabilize or destabilize the flow of the ice, depending on a varying number of parameters, and is therefore also an important aspect to study. In order to do so, you have to drill down to the bottom, 300 metres deep, and haul up an ice core with marine ice inclusions. It can then be analyzed in our lab in Brussels. What can one expect out of this study? If you look at Berkner Island, which is a much bigger ice rise within the Ronne-Filchner Ice Shelf, scientists took a deep ice core of several hundred metres deep. From this, they found that during the last glacial period, the ice rise retained a local ice flow. This means that either the grounding line did not move (which is very unlikely) or that the ice flow pattern was different from what most ice sheet models predict. It therefore appears necessary to improve ice sheet models, including the aspects associated with the complex ice flow. At present, ice sheet models are based on poor prerogatives (erroneous because there is a lack of complexity in most of these models). If we find that the ice flow is actually more complex, we will have to revise all the data and rework the models. The cryospheric component of future sea-level rise that can be found in the IPCC forecast still shows a large margin of error. We hope to help narrow down this margin.